You've probably heard me talk about Prairie Charms before (You can read my posts here and here). They have just about the cutest accessories and are always sending out the friendliest tweets. When they approached me a few months back about getting involved with a blogger programme for a new service they were launching I just couldn't say no. Flash forward a few months (and a lot of emails) and the blogger team were told that the new service would be a subscription box, 'Prairie Pizzazz', much like Glossybox and Birchbox - but with a twist. These boxes were to include accessories, jewellery, hair pieces and collab items. How exciting! We were asked to help by each creating a moodboard for the new theme for the box - Luau Party- and immediately my mind went racing. You can see my moodboard here. Time went on and I was informed that my moodboard was one of three to be selected as a winner, so not only would I receive my box, I would also receive some extra goodies, too! Woohoo! A new Prairie Pizzazz subscription box is launched every 2-3 months and costs £35.00 with a value of £75 or over, and includes at least 5 accessory or lifestyle based pieces. I have to admit, when I first heard the price it did shock me, but once I thought about it, it is actually very reasonable. Glossybox (and the like) will cost you £10 a month plus shipping so this works out equal to that and the best part - it is personal to you. Prairie Charms will contact you to ask what colours and textures you prefer and what your signature style is in order to choose the best items for your subscripton box, ensuring that every piece is something you enjoy and make use of. Some boxes will also include a 'Pink Ticket' which entitles you to a special treat, too! They just keep giving! My box arrived on Thursday 27th August and I filmed an unboxing which you can see at the bottom of this post. As you can see from my images, I received some absolutely stunning pieces which just scream Luau Party! Think tropical prints and bright colours plus lots of yummy treats! Everything was individually wrapped and was presented in some gorgeous packaging - a signature stamp for Prairie Charms! The first thing I picked out of my box was actually the collaboration piece! Created by 'Sweet as Honey Studio' this fun, colourful confetti features flamingos and pineapple pieces for the ultimate Luau Party decoration! The little bag even included a balloon so that you can create your very own confetti balloons - how adorable?! I tried some of these little gems by Prairie Charms before and I got addicted. They are literally the best thing since Nutella! These tropical inspired bands work to keep the hair tied back without pulling or ripping it out. However, they're so cute that I prefer to wear them on my wrists as bracelet style accessories. I just love the pink lace one - it looks amazing and so vibrant and I think the flamingo printed one is just adorable, I love the contrast of the bright blue and the shimmer of the gold. This is one of those pieces that can take an outfit from drab to fab! The bamboo design paper straws are the perfect mix of vintage and fun and really turn your punch into something special. Add in the flamingo cocktail stirrer and you can almost hear those waves crashing onto white sand. Someone pass me a coconut cup! The wonderful thing about this is that because of the depth of the blue it'll work from summer through to autumn and can really pull together that I-cant-be-arsed-to-do-my-hair hair! Made from Japanese glass, this anklet is just gorgeous. It shimmers elegantly in the sun and the gold chain gives it just a hint of luxury. I don't usually go for gold jewelry but I am happy to make an exception for this. I love the way that the bead hangs delicately off the ankle for a feminine finish. The stuff Tiki dreams are made of! 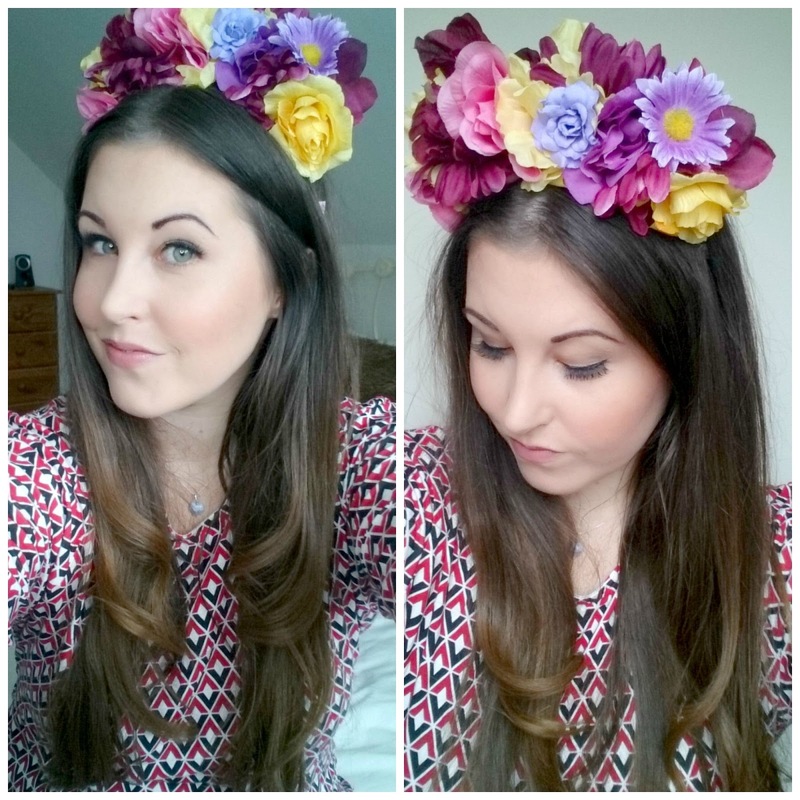 This custom floral Lei headband is the ultimate summer accessory and every girl needs one. It's one of a kind and so, so gorgeous! It's kind of elaborate and extravagant but I like that, and it looks amazing when you wear it. Each flower is carefully and thoughtfully placed and the underneath is even covered with purple petals to keep the flowers in place and to disguise the head band! Dreamy! This nail glitter is just beautiful, with coral, glistening blues and gold flecks it takes your manicure to the next level. I always despise removing glitter from the nails but this custom glitter is worth it. I can't wait to use it and I think it'll look fabulous with block white nails. Just when I thought this box couldn't get better. S'mores?! Need I say s'more? But, these aren't just your ordinary s'more, oh no, they are a mouthful of tropicaly goodness with the twist of coconut mallows. Delicious. It breaks my heart to have to open this adorable set but my stomach wont deny it any longer! And to finish, these sweet hair clips. I have to admit, aside from bobbypins I haven't really worn hair clips in a long time, but now I'm not really sure why. 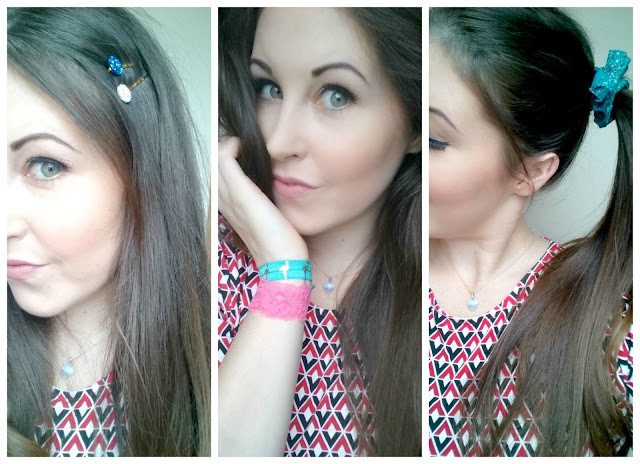 These seashell hair slides are so dazzling and look so pretty holding back all my annoying post pregnancy baby hairs! The blue one will work great with my new scrunchie and I've got a feeling the silver one will come in very handy at Christmas too! I was also super excited to have my blog name and twitter handle featured on the front of the box's card insert! Prairie Charms have really pulled it out of the bag with this subscription box. It's just so well thought out, from the flamingo washi tape on the box right down to the feathers and glitter within. It's truly personal and just so special. The next box is set to be released in September/October with an Autumnal theme - and if your a longtime reader of my blog you'll know I cant get enough of Autumn, so I am beyond excited for that one! You can get the full lowdown on the subscription box by tweeting to Prairie Charms (@Prairie_Charms), they are seriously the sweetest and have the friendliest customer service ever. You can shop the pieces (and much more) on their website and you can check out the 'Sweet as Honey Studio' website here too! Autumn is (almost!) here and in an effort to prepare myself for the colder days and the darker evenings, I've put together an Autumn lookbook / wishlist. 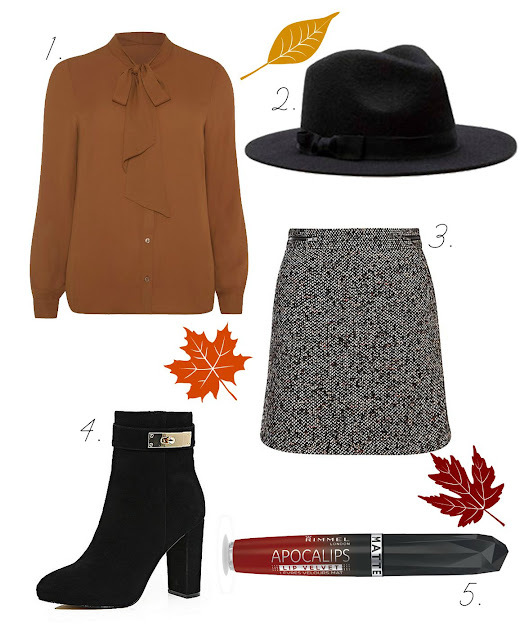 These are all items that I would love to wear this autumn but also that I think anyone could work. Comfortable yet stylish, affordable and fun, Autumn doesn't have to be a season for a drab wardrobe. Choose deep, berry jewelry and lips and tan accessories to complete any outfit, mixed in with some faux fur or a chic beanie you'll be toasty as can be! 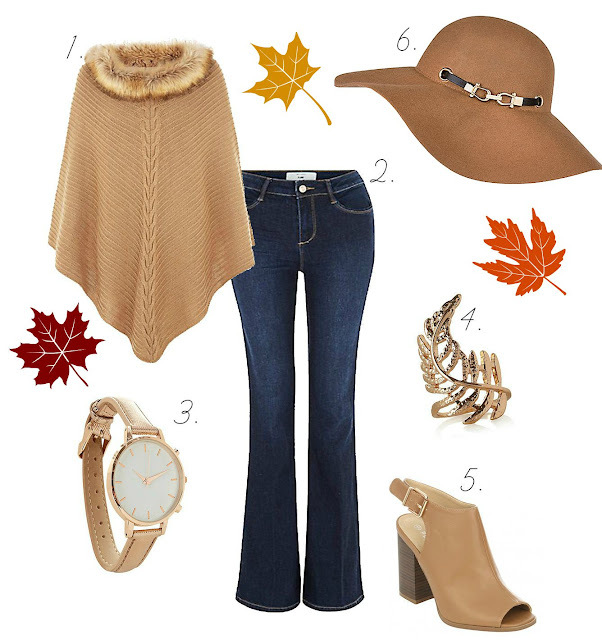 I love the 70's vibe that can be seen in the fashion world right now and this poncho and flare combo rocks it perfectly without going too OTT. Accessorise with a simple but elegant rose gold watch and this leaf wrap ring for ultimate autumn chic. Finish with these gorgeous tan mules and this buckle trim floppy hat to keep it classy and chic. Next up, a Gwen Stacy-esque outfit featuring this dreamy (and on trend) A-line suedette skirt and some sophisitcated over-the-knee boots. Keep it feminine with these cute lace trim over-the-knee socks over black tights and this amazing structured tote - the mix of deep colours will scream autumn! Add this cosy long sleeve top and finish with a seasonal manicure with Barry M's 'Paprika' Gelly polish. For the city slicker, try a ripped knee skinny jean and long sleeve tee combo. Team it with a slouchy knited beret for casual cool. 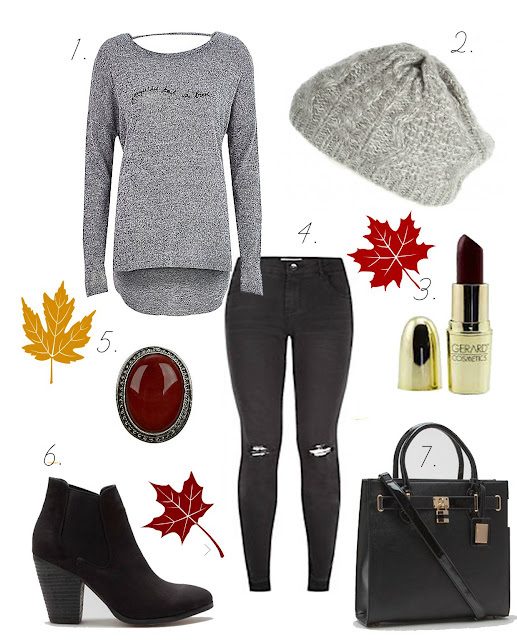 To lengthen the legs, wear these adorable ankle boots and accessorise with this oversized berry ring. Add a swipe of Gerard Cosmetics 'Cherry Cordial' lipstick to bring a pop of colour to the look and finish with this buckled tote bag. 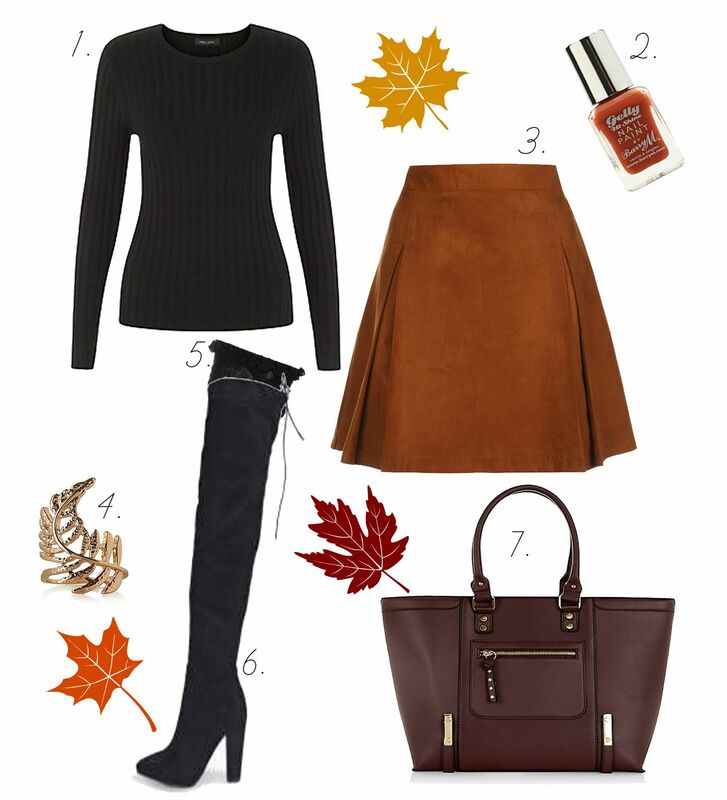 For some office autumn inspo (or even for dinner dates) how about this perfect textured mini? It'll look dreamy with this pussybow blouse and a wide brim wool fedora. Keep it sophisticated with these gorgeous lock heel over ankle boots and apply some of Rimmel's matte apocalips in 'Burning Lava'. Going on an autumn stroll? Slip on some classic skinnies but keep it current with this lace up top. Pull on this perfect faux fur lined gilet and slip into these suede zipped ankle boots! Grab this honey tote to keep all your must-haves in and finish with some '1995' lipstick by Gerard Cosmetics! I am really looking forward to wearing some Autumn Winter fashion and I hope my lookbook has helped you to prepare (or given you some inspiration) too! What are your autumn must-haves? I'm callin' it. Summer is over. Or at least, here in England it is. Therefore, I'm using up the last of my tropical, more exotic scented products before I switch over to warmer, more spicy treats. If you're looking for a last fling with summer, or are holding on to it as long as possible, I recommend these products. I always have a candle burning in the house and you just cant beat Yankee wax tarts. The scents are long lasting and strong and they have a brilliant burn time too - plus you can get them in a million and one 'flavours'. Close your eyes and whisk yourself off to a vacation dream spot, 'Pineapple Cilantro' is the perfect combination of tropical fruits and creamy coconut, which I just cant get enough of! Lazing on the beach not for you? How about the scent of sweet summer baking with 'Strawberry Shortcake'? Its deliciously fruity and oh-so sweet. How about a drink to go with your summer salad? 'Peach Smoothie' is a yummy blend of juicy peach and sweet undertones that makes the home smell like a summer afternoon! I had my eye on this limited edition range for a while and when I had the chance to choose a free gift with my 'Love your Body' loyalty card, I just knew I had to pick it up before it sold out. The light and refreshing scent is perfect for those summer showers. It's sweet, citrus-y and delicately minty and leaves my skin feeling super soft and hydrated. I love the amazing green colour of the gel, too, it really brightens up my bathroom! Are you noticing a cocktail theme here?! Body sprays are perfect for the summer, they're light but give you a little something to be remembered by. You probably know by now that I am in love with the Victorias Secret body mists - but at £10 each they arent exactly cheap, a much more affordable alternative are the Dollys Mixtures body mists, retailing at just £2 each. They come in a range of addictive scents from 'Peach Melba' to 'Candyfloss', but my personal favourite has to be 'Pina Colada'. It smells exactly like you'd hope and is just so refreshing. These dont last all that long on the skin but the bottle size is handbag friendly so you can keep it handy for top ups throughout the day. Sometimes there really is nothing better than taking some time to relax with a face mask. During the colder months I prefer to use self heating face packs but in the warm summer months I chose cooler, more refreshing ones. The 7th Heaven (formerly 'Montagne Jeunesse') masks are my go-to for sure, my skincare draw is full-to-burst with them. They have a wide selection of 'flavours' and finishes (scrubs, muds, souffles) and are super cheap, plus they are cruelty free. They really work into the skin to leave it fresh and clean. Creamy Coconut is one of my favourites for the summer as its super rich and moisturising and gives my skin the boost it often needs. If, like me, you've tried and enjoyed other Palmers products in the past, you are going to love this. Much to my surprise, it doesn't smell particularly like coconut but it does work wonders on the hair and has the added benefit of no sulfates or parabens. Of course, I am not saying that hair care is exclusively for the summer months, but products like this seem to have more of a charm in those months. This little treasure includes ingredients like coconut milk and silk protein which work to replenish and revive your hair to its full, bouncy glory. Anything that dries my nail polish faster is more than welcome in my manicure kit - especially now that I'm a mum. There is literally nothing worse than being 'helpless' waiting for your nail polish to dry for what feels like hours on end. 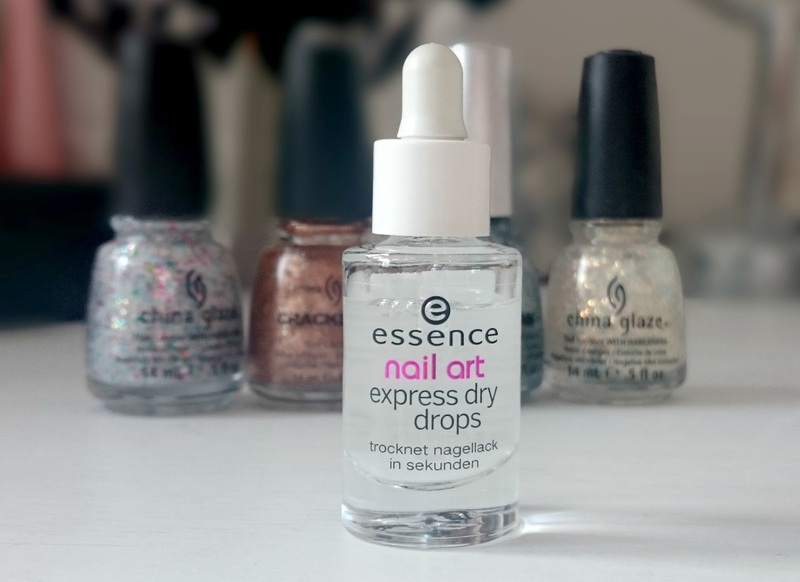 When on a shopping trip recently I came across the Essence 'Express Dry Drops' (£2). This promises to dry your nail polish in just 60 seconds and nourishes your nails and cuticles with Vitamin E and almond oil. To be honest, I did think 'will this actually work?! Especially at that price', but nonetheless I was curious and wanted to try it. As always, I applied my base coat first - I am loving the Maybelline Dr Rescue Nail Care CC Nails - and let this dry as usual, it's pretty quick to dry on its own, actually! I then went in with two coats of Rimmel's Salon Pro 'Oh,Mr Darcy' polish. The Essence Express Dry Drops instruct you to add 1-2 drops of the liquid onto each nail with the pipette provided, so that is exactly what I did. I waited 60 seconds and I have to admit my nail polish was not dry, but I was patient and decided to give it a chance and wait a little longer. And I'm so pleased I did. My polish was touch dry in 3-5 minutes and totally, rock-solid dry in just 8-10 minutes. So impressive - and a brilliant time saver! Gone are the days of sitting restlessly waiting for your nails to dry with a hundred and one 'I need to do that's' running through your mind! Lone gone! I have used this again since with a variety of polishes and brands and I am happy to say it is effective with all of them - not just thinner polishes! 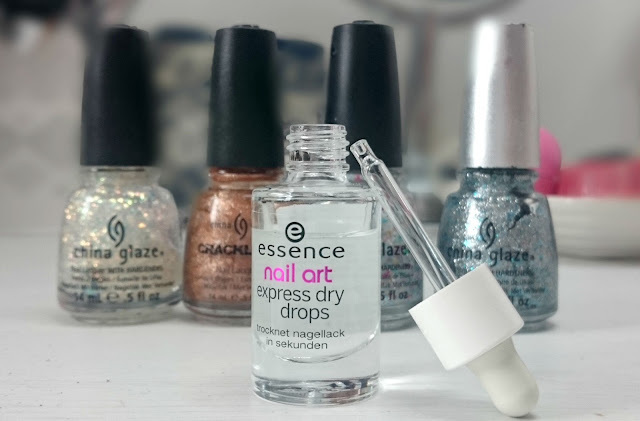 I would like to point out that the Express Dry Drops are not a substitute for top coat and you should still apply this is you want a longer lasting, shiner finish to your manicure, but it will, of course, help to dry your top coat faster! Yes! Definitely. It made my polish touch dry in 3-5 minutes and totally dry in just 8-10. I am addicted and use it for every manicure now! I am not quite sure why my bottle seems to be printed in a foreign language, but that doesn't take away from the fact that this product truly works and is a complete bargain! This product also comes in spray form (£2.50), for those of you who prefer to avoid oil-like products. Have you tried any products from the Essence collection? Once in a while you come across a boutique with such adorable clothes that you don't know how you did without them before! 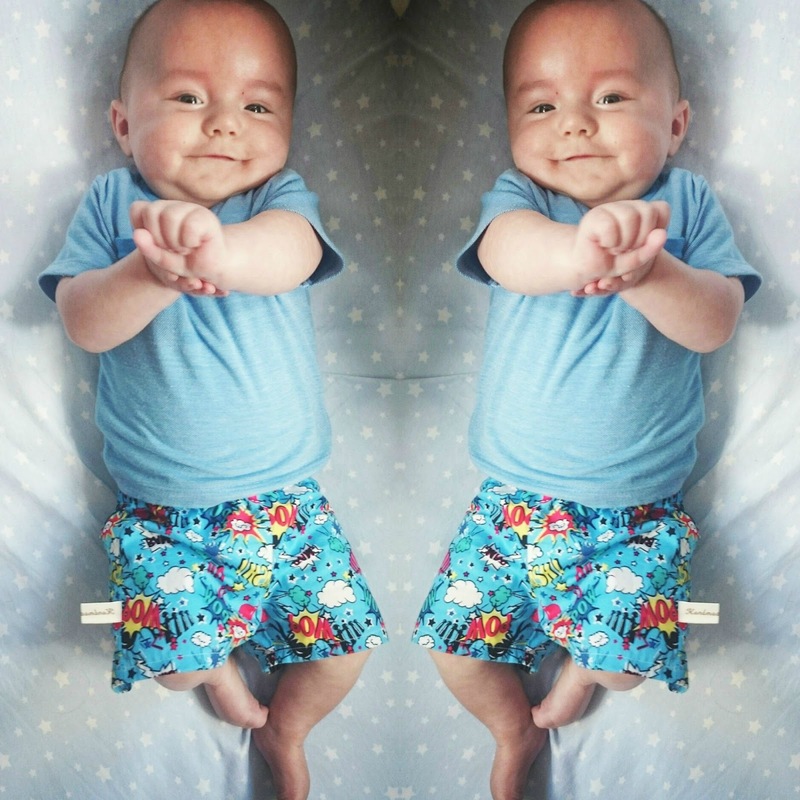 This very thing happened last week when I was oh-so kindly gifted the most adorable pair of shorts for Elias by Handmade by Dani. Dani lovingly crafts beautiful babies and childrenswear with all kinds of designs and in all kinds of styles from dresses to ties - and everything in between, all from her own home in Hampshire. When I received these uh-mazing comic strip themed shorts for Elias I was so, so pleased. They are absolutely perfect, right down to the last stitch. There is something about an item that is not mass produced which makes it so much more special and thoughtful - and I've already had a few 'Where did you get those shorts?' at a baby group Elias and I visit every week! The shorts come in a range of sizes starting at just £8 and are truly beautiful. The elasticated waist makes them easy to pull up and down - which is much appreciated when you have a wriggly infant nappy to change every few hours - and it also makes them super comfortable for little ones! The 100% cotton fabric is soft and flexible which makes for ease of movement - essential for a little guy who is always on the go, and they are finished with a little 'Handmade by Dani' label - such a personal and thoughtful touch. Something I was really impressed with on these shorts is that there is a tag displaying care and washing information. There is always a worry with something that has been handmade that you wont wash it properly and it'll shrink or tear, but Dani has eliminated this worry with another thoughtful touch to her pieces - a mothers dream! Elias loves his shorts and his comic book mad daddy is always happy to see him in them, too! I cant wait to put Elias in some more of Dani's gorgeous pieces - I think I want to get him a darling little tie next! You can see all of Dani's work and keep up to date with her work on her Facebook page!